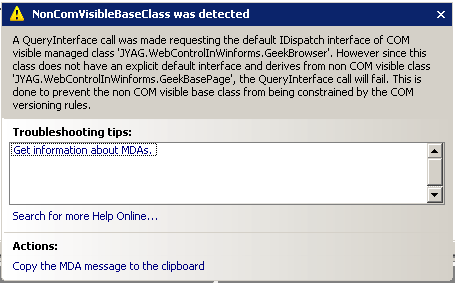 A QueryInterface call was made requesting the default IDispatch interface of COM visible managed class ‘JYAG.WebControlInWinforms.GeekBrowser’. However since this class does not have an explicit default interface and derives from non COM visible class ‘JYAG.WebControlInWinforms.GeekBasePage’, the QueryInterface call will fail. This is done to prevent the non COM visible base class from being constrained by the COM versioning rules. The simplest solution is to make the baseclass ComVisible just as well. But in my case it was not an option to expose the baseclass to Com-components. So what can we do to make this work without having to make the baseclass ComVisible. There are three easy steps to take to accomplish this. The last thing we must do is implement the Interface. If we do so the code my look something like this. That’s all there is to it. Now our exception at runtime disappears and our code works. And our baseclass is not ComVisible. Download this code in the adjusted test project. For comments, questions or suggestions contact me or leave a comment below. I used it for a different case and it worked too!